i'm thinking something unique rather than the standard wooden handle, although I'm not adverse to the standard. so, what unique items have you created or "modified" to create your handles? If I go with wood, any on-line recommendations for cost-effective beer tap handles?? I went to Lowe's and bought table legs made of oak. Then I screwed in the brass insert to thread them on to the faucets. Finish it off with a stainless drawer pull on top. Until i make more unique ones I just use the black plastic ones that are like 3 bucks. 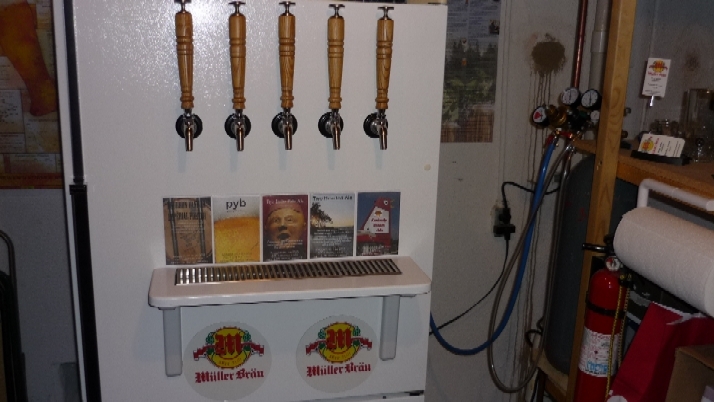 I use a whiteboard behind my tap handles to write the beer stats/info. Nice and simple, plus matches. I like the idea of the white board, but hopefully not have to have the black plastic handles. I just got these yesterday. Put labels in them today. I think they're pretty cool! I thought they'd be flimsy and light, but they are pretty solid and have some weight to them too. Another cool idea with these is too fill them with some grain or hops. Oh and they're only $15 each. Good price compared to other prices tap handles. I tried these new guys http://taphandlestogo.com They are a Canadian company. It was pretty easy to do. You can use their templates to do up the artwork yourself or you can have them help. The handles are really good quality and shipped in 3 days.